3.2 Im generaly confused on getting all the links set up,Will I have to find icons for all the files or is there another way? 3.3 When I do assign an icon I can only see a portion of it, is there a way to fix that? 3.4 Where do i get the poweroff, reboot and main scripts ? 3.5 Can i use both dmenu and gmenu2x (or another menu) at the same time ? 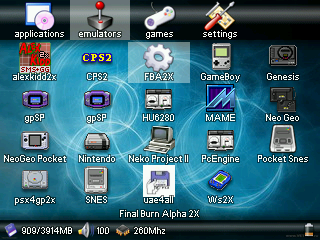 I ported gmenu2x to dingux, it has all the features of the original gp2x menu working and I fixed 2 small bugs in the original code (dealing with new links that didn't show correctly). I also added battery reading and a LCD Backlight setting, made the volume changing work and a few other things. the menu needs to be placed in local\gmenu2x (on the sd card, and no other place, the zip already contains the gmenu2x folder so just extract to \local). Im generaly confused on getting all the links set up,Will I have to find icons for all the files or is there another way? at first press select then choose the last option (the scanner thing), this will search your sd card starting from /boot/local (\local on the sd) for *.dge files and will automaticly add them in a temporary "found dge" folder afterwards edit the links in the found dge folder and move them to the sections you like (like emulators, games, etc). When I do assign an icon I can only see a portion of it, is there a way to fix that? Icons have to be a 32x32 png image with the same name as the executable, if they are larger than 32x32 you'll only see portion of it. Where do i get the poweroff, reboot and main scripts ? Can i use both dmenu and gmenu2x (or another menu) at the same time ? in the gmenu2x.dge do a "rm /boot/local/sbin/main" and a "cp /boot/local/sbin/main.gmenu2x /boot/local/sbin/main"
in the dmenu2x.dge do a "rm /boot/local/sbin/main" and a "cp /boot/local/sbin/main.demnu /boot/local/sbin/main"